Once you’ve completed my basic tutorial on object oriented PHP, you can learn to build object oriented PHP apps with my NEW interactive courses. For an amazing price: $29! â€¦ Yes, with 350 videos and 900 quiz questions, you will be learning much more than PHP! rest will come much, much easier. like a boastful claim, I know, but that’s what the nerd zeitgeist is saying. â€¦ Or so I’ve been told. 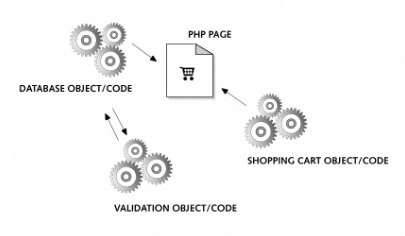 This tutorial is designed to teach total beginners object oriented PHP. PHP much easier… and less boring too! So before you begin, get out your favorite PHP code editor and be ready to write and run some object oriented PHP code. PS: scroll to the bottom of the page for the supporting videos. php finally had a complete OOP infrastructure. The difference between building a php application the old fashioned (procedural) way, versus the OOP way. What the basic OOP principles are, and how to use them in PHP. When you would want to use OOP in your PHP scripts. People run into confusion when programming because of some lack of understanding of the basics. The basics are really important! knowledge, you will be able to explore OOP further. OOP Videos – NEW in August 2016! The following videos are designed to supplement the tutorial, but they are not requiredÂ viewing. First you will find my new videos, and they are not nearly as crappy as my classic videos … found below. The new videos are updated for PHP7. … I just got one up, but if you like it, shoot me an email and I will do more. The following videos are designed to supplement the tutorial, but they are not requiredÂ viewing. These are my classic OOP videos, butÂ they are still largely good. But,Â they look kinda old, and I look younger!